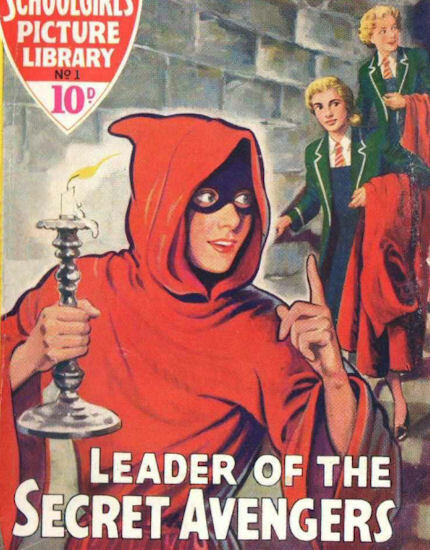 History: After Norah Staveley framed her, causing her to be expelled from Priory School, former head girl Mary Wallis secretly returned to the school at the start of the next term, donning a hooded costume to become the Secret Avenger. 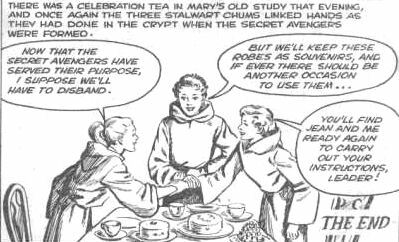 She soon recruited two trustworthy friends, Linda Blake and Jean Chalmers, to become her co-conspirators, forming the Secret Avengers. They soon discovered that Norah had wanted to have the use of the Head Girl's study because it gave access to a hidden passage used by Sir Richard Tressidor, who had owned the priory at the time of the English Civil War, a passage that Norah's crooked uncle could use to smuggle goods. Caught in the act, Norah confessed her crimes, exonerating Mary, allowing her to be reinstated as Head Girl. Comments: The Secret Avengers are another school conspiracy group, and may well be a reprint of the Silent Three with slight modifications. Thanks to Stephen Montgomery for providing information and pictures for these characters.